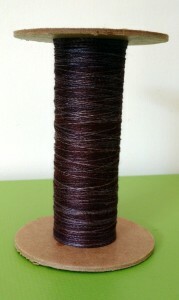 While digging around in an old WIP basket, I came across this spool of spun silk. This must have been spun on a wheel some time back. Why? It just doesn’t have the same amount of twist that I put in when spinning on a drop spindle. There’s about 1.5 oz of silk on that spool. Based on the colors, I am guessing that it is Chasing Rainbows Bombyx. These will be going back through the spinning wheel again to add more twist. The question is do I ply it or do I leave it as singles for weft. Plying will definitely be more versatile but more work before it can be used. And no, I have not reached the end of my silk spinning obsession.